09/01/2016 - Time is running short for APWU retirees who are interested in applying for temporary positions as Holiday Clerk Assistants: Applications are due Sept. 11. The Peak Season Exception Periods memo signed by President Mark Dimondstein and the USPS Vice President of Labor Relations in September 2015 has been carried forward into the new contract. 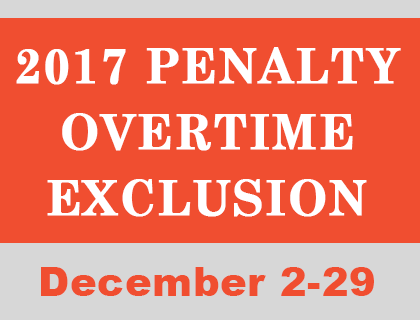 Therefore, retirees will have the opportunity to be rehired as temporary Holiday Clerk Assistants again this year – this time in both Mail Processing and Customer Service. The APWU and USPS agreed to extend the 50-mile limit on excessing in a Memorandum of Understanding (MOU) dated Sept. 28, signed by APWU President Mark Dimondstein and the USPS Vice President for Labor Relations. The original MOU, Minimizing Excessing, which was slated to expire with the 2010 contract, is extended until May 20, 2018, or for the term of the next Collective Bargaining Agreement, whichever is later. 10/07/2015 - The APWU and USPS agreed to extend the 50-mile limit on excessing in a Memorandum of Understanding (MOU) dated Sept. 28, signed by APWU President Mark Dimondstein and the USPS Vice President for Labor Relations. The original MOU, Minimizing Excessing, which was slated to expire with the 2010 contract, is extended until May 20, 2018, or for the term of the next Collective Bargaining Agreement, whichever is later.